Rain started in the morning, never stopped. It was the first day of rain for several months, unusual for the Northwest. When we lived here all year, I was accustomed to riding in the rain. Now it was hard to get started. I took my time overdressing – tights, wool socks, wool jersey, raincoat, plastic bag inside my helmet. I rode my fixed gear. It’s a great bike for the rain because it has fewer parts to get dirty. I don’t think I’ve cleaned it for five years. I started riding fixed wheel in the early ’80’s. Part of our race training was to ride fixed gears from September to January. 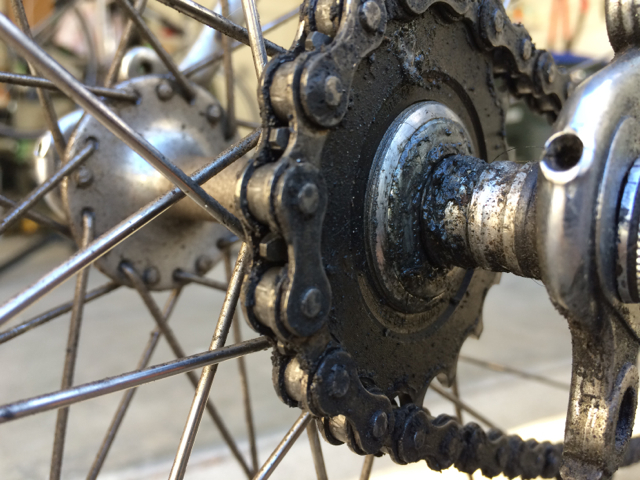 42 – 17 was the standard gearing, meaning a 42 tooth chain wheel and 17 tooth rear cog. We simply converted our road bikes by removing the freewheel, screwing a track cog onto the threaded hub, and wrapping a track chain (thicker than a standard road chain) from the 42 tooth inner chainring around the track cog. Regular track bikes also had lock rings on top of the rear cogs. We didn’t bother with them, meaning if we backpedalled too hard, the rear cog could spin off the rear hub. Riding fixed wheels helped develop our ability to ride smoothly, because we were never able to coast. We also developed pretty good spins, developing our fast twitch muscles, key to a good sprint. We learned this training technique from Mike Kolin, who used to coach the Rainbow Schwin team in Seattle. (Since 2004, he’s been in Scottsdale, AZ, coaching and developing some great young racers on another team: Strada.) I can still picture him leading a double pace line of 15-20 riders up and down Ames Lake Hill on a rainy Sunday morning. Back to my rain ride. I don’t have anywhere near the spin of the old days, so I tend to use the brakes frequently, and backpedal more than the old days. On this particular ride, I was riding a bumpy dirt road and actually managed to spin the cog back off the rear hub. That never happened before. It was quite a shock when suddenly the pedals spun free of the drivetrain. Picture at the left shows fixed cog on old hub with five years of grime and threaded hub.